Lighthouse Award, thank you holley4734! holley4734 of the blog Destino was so generous to nominate Dear Kitty. 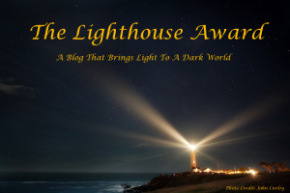 Some blog for the Lighthouse Award. Thank you for this wonderful gesture! 1. Inform then on issues often not found in the mainstream media. 2. Help them to think critically. 3. Point out where in the world there is beauty and hope. The Lighthouse Award, thank you, Horty! An honor …. humbly accepted!!! TY …. Well deserved, dear Horty 🙂 Thanks for reblogging! And thank you so much for the nomination. I am honored and shall make a post soon! Thank you very much for the nomination! The concept behind this award is inspiring! Well deserved 🙂 All the best for you, your blog and the museum! Well deserved 🙂 Best wishes for you, your blog and the music!